You give it, they get it…CHANGE! This week we ventured back into Campbell School (it has been a while – our kids are now in High School) to help a fourth grade class make this PSA (Public Service Announcement). MetuchenLiving hauled its video gears and lighting equipment. We were amazed at the passion in the kids in thinking about this program, making their shirts, writing the script and helping each other out practice their lines! Malaria is a disease which affects millions of people around the world, especially children in Africa, who are under the age of 5. It is spread by the female Anopheles mosquito with just a single bite. The most effective way to fight this devastating disease is to donate and promote the use of insecticide treated bed nets in less fortunate parts of the world. 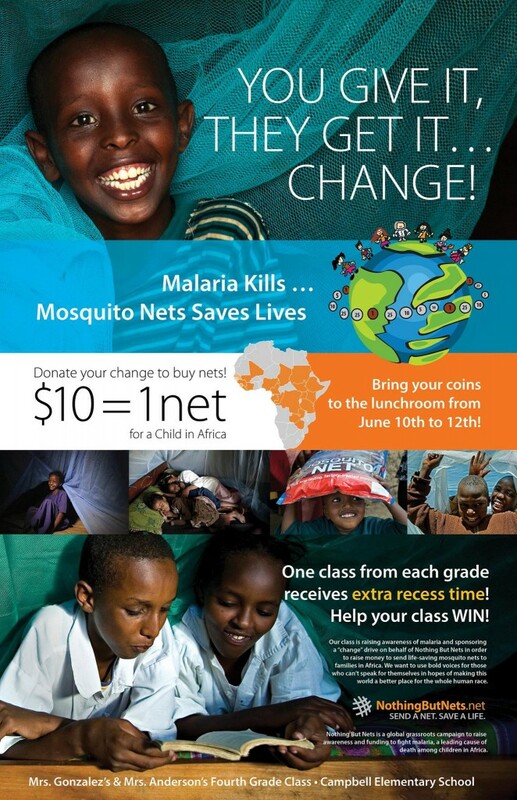 Mrs. Gonzalez’s and Mrs. Anderson’s fourth grade class is hoping to fundraise $1,000 to donate to Nothing But Nets. One hundred nets will save many lives! You can help by donating through this link.